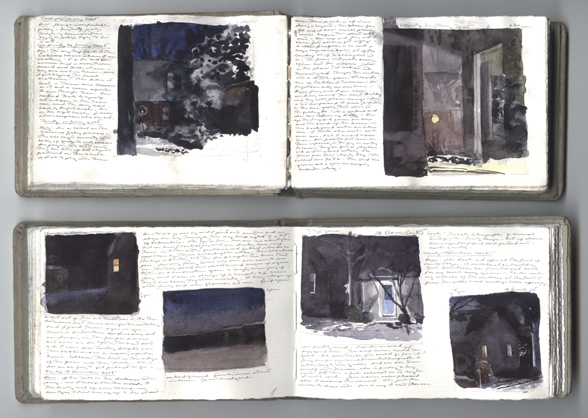 (above) Charles Ritchie, Two Journals, 2005, watercolor, graphite, and pen and ink on Arches paper in bound volumes, page size: 4 x 6″. Between 1952 to 1954 writer Jack Kerouac kept little notebooks in his shirt pockets vowing to jot the streets down like a painter would paint them. In 1957 he transcribed the notes from these fifteen pads into his Book of Sketches a volume that has rarely strayed from my bedside since it was published in 2006. I love the raw energy of Kerouac’s writing of this period. His economy of means and the vivid intensity of his descriptions are the product of a man on fire with the energy of everything he is seeing. The visual acuity of Kerouac’s work has been a model for the way I want to put things into my book. Not so much his content, but his urgency and sense of discovery. This means for both my writing and painting. Kerouac has an intuitive sense of using just the right elements to make his descriptions pop; no excess. I can imagine having his book with him at the moment the inspiration struck. For me, that’s the magic of carrying a journal and working in watercolor. No need to set up. Just waiting for the fire. An excellent review of Book of Sketches with examples of Kerouac’s writing is here.